The purpose of the quality audit is to determine if project activities comply with organizational policies. Procedures, and processes. The quality audit has a number of objectives associated with it, but root cause analysis is part of process analysis to identify needed improvements in the process improvement plan. The weighted Pareto analysis gives a measure of significance to factors that may not appear significant at first, using such additional factors as cost, time, and criticality. A basic Pareto analysis identifies the vital few contributors that account for most quality problems, and the comparative Pareto analysis focuses on any number of program options or actions. Top management should provide constancy of purpose so that it can be infused throughout the organization. Constancy of purpose also requires a shared belief among organization members that management’s behavior clearly signals its commitment to and support of achievement of the vision. Quality assurance and control are functions that must be performed by everyone, not just those assigned to specific departments. The quality management plan describes how the team will implement the quality policy, which describes the objectives of the project regarding quality management. Q. 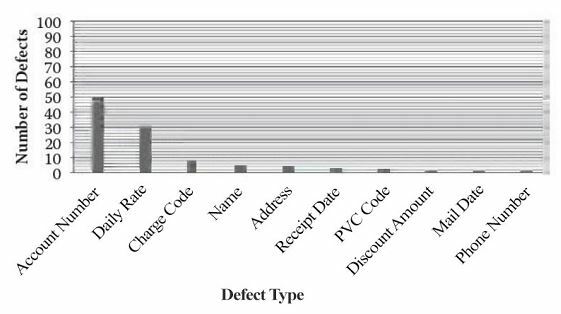 1115: The below Pareto chart indicates defects in areas associated with billing a client for project services. Based on this Pareto analysis, which area, or areas, indicate the greatest opportunity for improvement? A. The account number, because if it is incorrect, the invoice may be sent to the wrong client. B. The daily rate, because if it is incorrect, the total amount of the invoice will be wrong, which impacts the cash flow. C The charge code, name, address, receipt date, pvc code, discount amount, mail date, and phone number. because they are fairly easy to confirm and correct, thereby significantly reducing the types of defects. D. The account number and daily rate, because they account for 80 percent of all defects. Pareto analysis focuses on what Joseph Juran called the vital few. Named after Vilfredo Pareto, an Italian economist whose studies showed that 80 percent of the wealth was held by 20 percent of the population. quality analysis typically shows that 80 percent of the all problems (defects) are found in 20 percent of the items or areas studied. The first and most important is to identify the problem as a gap to be closed or as an objective to be achieved. Causes then are found by looking at the problem statement and asking why until a root cause has been identified for which action can be taken or the reasonable possibilities on the diagram have been exhausted. There are two types of control charts: variable charts, which are used with continuous data, and attribute charts, for use with discrete data. Attribute data have only two values (conforming/ nonconforming, pass/fail. go/no-go, or present/absent). In this situation, you are looking for the presence of the required food label. A part of the overall project management plan, the quality management plan should address all aspects of how quality management will be implemented on the project and how the project team will implement the quality policy. Trade-off analyses are business judgments and, as such, are not procedural steps to be included in the quality management plan. Q. 1119: You have been assigned as project manager on what could be a “bet the company” project. You realize that to be successful you need to exercise maximum control over project resources. Which form of project organization should you establish for this project? In a projectized organizational structure, all project team members report directly and solely to the project manager. He or she has complete control over these resources and, therefore, exercises more authority over them than when in any other project organizational structure. Q. 1120: Which of the following is a ground rule for project team building? Starting the team-building process early in the project is crucial for setting the right tone and preventing bad habits and patterns from developing.